This website allows you to search for chalets world wide and deal directly with the owners. Do you like the look and feel of this site? It was designed by Spark Design and their team of websmiths. Just one of the many fine services we have available in the Bulkley Valley. By the way, they'll work for people from outside too. Last Frontier has explored the vast ranges that bound Ningunsaw Pass in northwestern B.C. for the last twelve years. They have built a beautiful little village, an oasis in the wilderness along Highway 37. Their guides' team is second to none and I can fully recommend them. Joerg Wilz lives and operates out of Canmore in the Rocky Mountains. He is an outstanding mountain guide and if you want to go to the Alps with a Canadian guide, he is your man. Vince Anderson's name is connected with incredible exploits in the great ranges of the world. He has been awarded the Piolet d'Or for those achievements. Vince also sometimes guides at Burnie, which is an honour for me. A lodge near Yoho Park offering self-guided and self-catered trips. One of the earliest and most famous lodges in British Columbia, Battle Abbey was built by the late and great Hans Gmoser and is operated by his son Robson. Self-guided, guided, catered, self-catered - this lodge offers it all. There is history here! Renaissance man Art Twomey and his wonderful partner Margie Jamieson built this lodge before many people thought about them. Still going strong with the Yanceys! This is the Sheraton, Ritz and Hyatt of the lodge world. And very close to Vancouver, with great skiing and cross-country skiing. On the west side of the Rockies, this area has both snow, terrain, and a comfortable lodge. A simple, rustic, beautiful log lodge near Valemount. Dezaiko is our nearest neighbour, a mere 400 km away to the southeast in the snowy northern Rockies. Here is the largest hut-to-hut operation in British Columbia. The three lodges in the Esplanade Range were joined by Sentry Lodge to make four! Nelson, Selkirk Mountains, Valhallas: a great combination. Another combo: the well known Icefall Lodge has been joined by Canada's highest lodge, the new Lyell Hut. In the Kokanee Range, with a long history. Just west of the divide, and its famous Wapta traverse, sits Mistaya on the snowy side of the Rockies. A very comfortable lodge. Welcome to the first, the authentic Rockies lodge, run reliably by the Renners. A great variety of terrain, and a beautiful lodge. Here is a true luxury lodge in the Purcell Mountains, with mostly gentle terrain and incredible views. Big terrain. Wonderful food. Guided and catered. This operation personifies ski mountaineering in Canada: big alpine terrain, and the dedicated guiding family that makes it accessible. Famous tree skiing in the southern Monashees. Knowing Tannis Dakin will make you want to be at Sorcerer. She is its soul. It also has great skiingterrain! High up near Mt Assiniboine in the Canadian Rockies. I have to admit - I get confused with the lodges down in the Kootenays! This one is famous for its tree skiing, and is ably run by Leo Jansma. Jasmin Caton and Evan Stevens run this great lodge in the Kootenays. A great variety of terrain, guided and self-guided trips. Three lodges in beautiful, remote Wells Gray Park. Here is our other neighbour, 500 km south. They are north of Pemberton in the Coast Mountains - need I say more? My friend Herbert Bruckmaier runs Bergimpuls, a small guiding company based in Regensburg, Bavaria. I can fully recommend him for any trips in the Alps. Thomas Stephan and I worked together in the Alps for many years. He runs Alpinsport out of Baden-Baden in the Black Forest, but of course ranges all over the Alps. I can fully recommend him. James is a guide's guide: a wealth of experience in the Rockies and around the world, and professional to the core. I am proud to be working with him. Robert Strouhal and his team of mountain guides are doing what we are doing here: provide their guests with a great experience while staying small and personal. We recommend them for all your trips in the Alps. Cliff Umpleby and Jan Neuspiel have struck out on their own after many years working in most aspects of mountain guiding. They concentrate on their home mountains on Vancouver Island, but will take you wherever your sense of adventure takes you. Giacum Frei, a Swiss-Canadian (or is it Canadian-Swiss?) 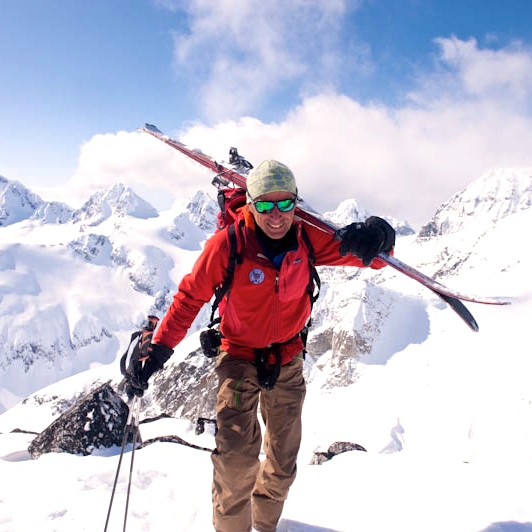 mountain guide, operates Skeena Heli Skiing in the wonderful ranges around the upper Kispiox River and in the Sicintine and Shelagyote Ranges. Based in the beautiful Bearclaw Lodge, this is one of British Columbia's finest new heli ski ventures. Is the week you wanted to book full? Check this new site that showcases all the lodges in B.C. that have formed a professional association. High standards and good skiing are guaranteed everywhere. John Kelson builds those fantastic walkways in the canopies of tropical rainforests that you know from nature shows. He also lives in Smithers and is a friend of ours. We're trying to build a trail to the Burnie Glacier Chalet. The Cat Skiing Directory provides snowcat powder skiers with the best operator information for cat skiing in Canada and the United States. Get up-to-date snow reports from the Cat skiing Directory and plan your cat skiing vacations with us online. This site lists guides, accommodation and gear throughout the world. Kevin Knight pulled into an eddy on the Bulkley River a few years ago and now runs our northwestern rafting outfit. Day trips on the Bulkley to long expeditions in the Northwest Territories - he does them all, and well!